Our house was built of old. The title given to this short paper reflects the fact that it is unfortunately not possible – at least from the sources I have been able to consult – to construct a continuous history of The Vine and its inhabitants. The sources of information I have found illuminate parts of this history – some with greater or lesser degrees of detail – but there remain periods of time, when the house and its adjoining land were clearly in thriving occupation and use, but which are more or less a blank. 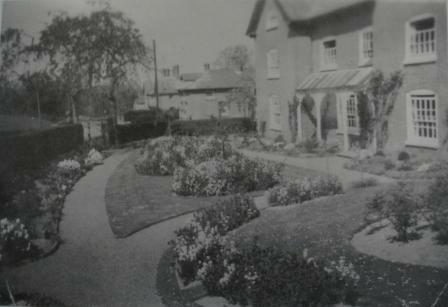 This is especially true of the origins and early years of the house – something which is almost inevitable with all country houses which are at the same time of some antiquity but which were not sufficiently important at the time of their first erection to attract a record of their early years. Most of the information I have been able to acquire on the history of the house was found in the County Record Office in Hereford. Of this the most illuminating part came from the archives of the Foley family of Stoke Edith and I must before all else express my appreciation of Andrew Foley’s kind permission to consult these archives and also his various other thoughts and suggestions on the history of the house (the fortunes of which, as will be seen, were linked to the Foley family for 300 years) expressed to me from time to time. I would also like to thank Robert Deem, June Andrews, Andrew Richmond and Jill Evans for their fascinating recollections of the house and its inhabitants from the 1950s to the 1980s, Andy Bradford for information about the Zimmerman era, Dianne Handy (herself a descendant of one of the house’s longest residents, the Edwards’ family), for shedding much-needed light on the complications of Edwards’ genealogy (and the intriguing connection of that family with Charles Mason) and Tim Hoverd, of Hereford Archaeology, for casting his eyes over my speculations below on the origins of the house and village and for making various valuable suggestions. Finally my thanks to Phil Preston, firstly for the suggestion that inserting a few relevant photos, maps etc. into the text would liven it up somewhat (though he put it more tactfully! ), and secondly for arranging for this to be done by means of technology way beyond my capabilities!